Here's where it all began: This is a Marvel trade advert (which I've spotted in THE COMICS READER and COMICS INTERVIEW and probably appeared elsewhere too) hyping the launch of the 1984 THE TRANSFORMERS limited series. I doubt anyone anticipated quite what a cultural milestone (and money-making - ahem - machine) the franchise would become. 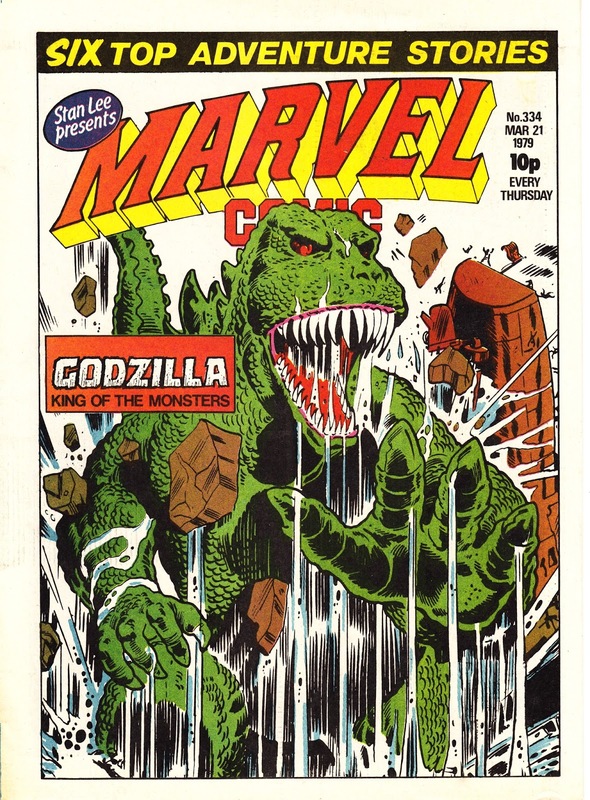 For Marvel, this was a punt on an unproven toy line (which is why they bunged Spider-man into the third issue) being bankrolled by toymaker Hasbro (who they'd already partnered with on G.I. JOE). 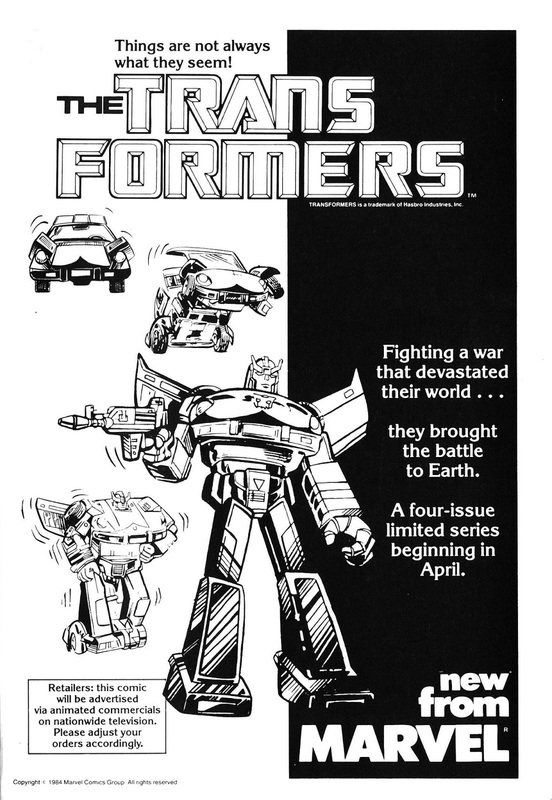 The four issue run formed the basis of the first eight issues of the Marvel UK fortnightly, which they subsequently reprinted (in colour) in the first two Collected Comics specials and in the - misleadingly named - THE TRANSFORMERS: THE COMPLETE WORKS, a two volume hardback set. How the mighty do fall. 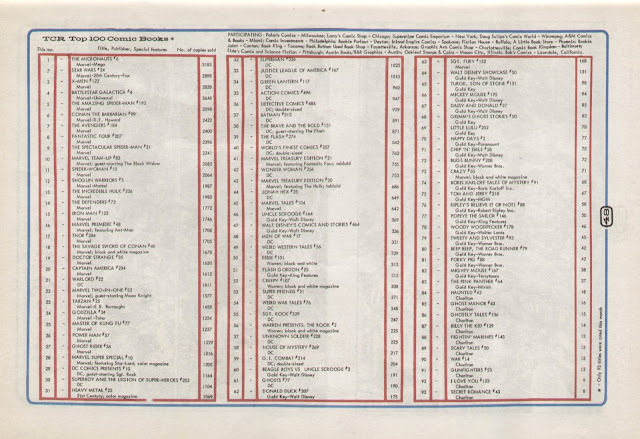 I found these sales charts in copies of the seventies/ eighties US fanzine THE COMICS READER. 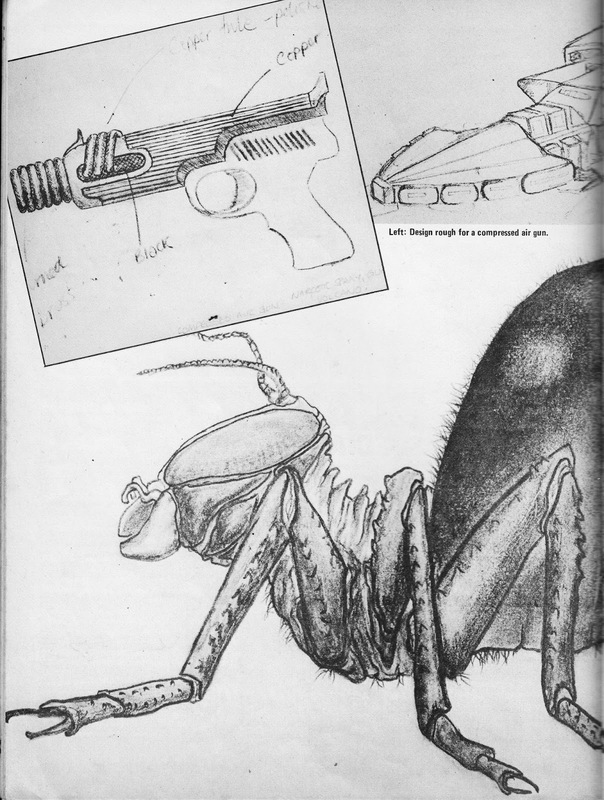 I thought they made interesting reading. The first is from June 1979 (issue 169) and is the earliest I could find (and - I think - the first published). The top five make for interesting reading and really capture the STARLOGGED vibe. The X-Men and Spider-man are there (of course) but so are The Micronauts (1), Star Wars (2) and and the 4th issue of Battlestar Galactica (4). Hurrah. 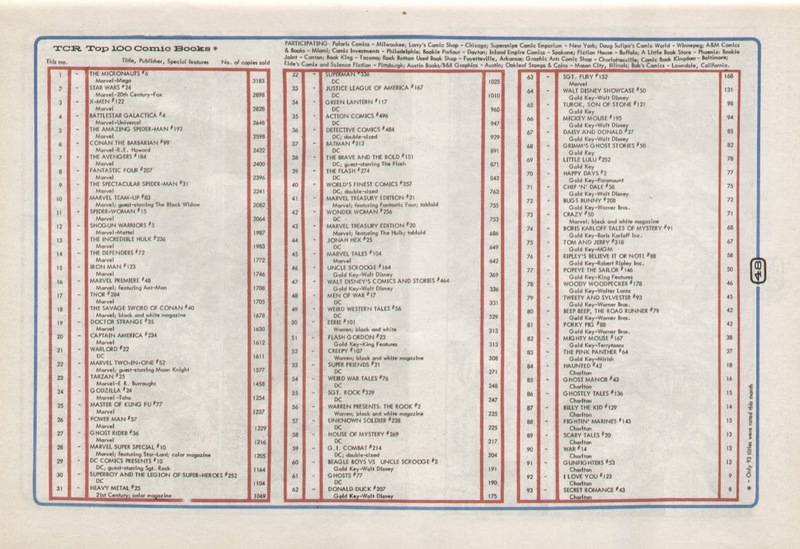 By way of a comparison, the second Top 100 is from February 1981 (issue 188) shows that the 23rd - and final - issue of BATTLESTAR had plummeted to 32nd place. 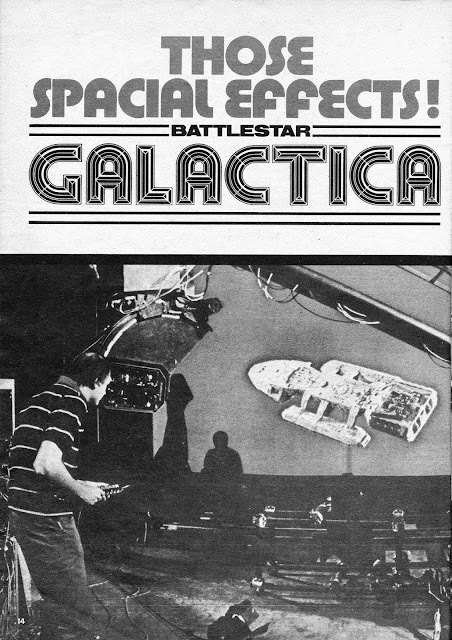 No wonder Marvel decided to cut their losses once the TV show bowed-out (save for GALACTICA 1980 and the syndicated cut-and-shunt teleflicks) back in the summer of '79. 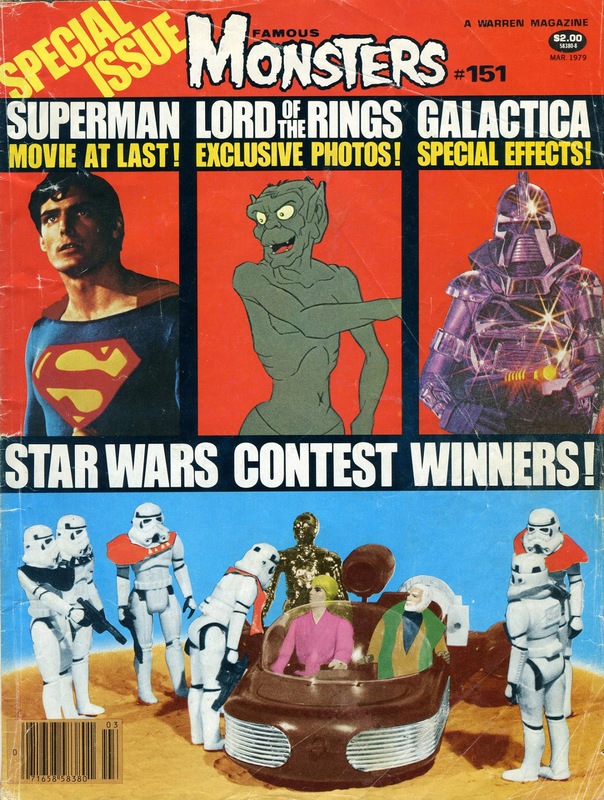 The 'nauts and Star Wars (now joined by Star Trek and Rom) were - in comparison - faring much better. 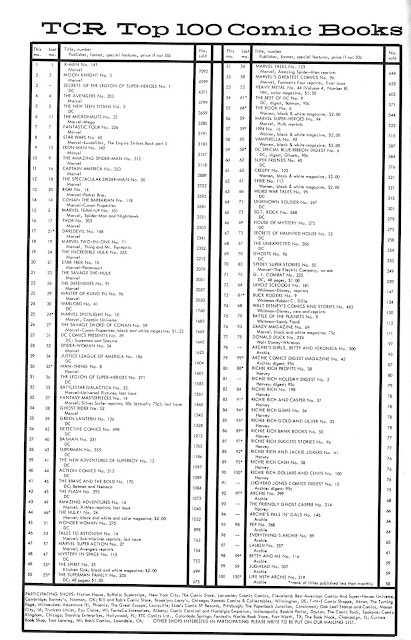 Also lurking - towards the bottom - of the 1981 chart are the likes of Buck Rogers (73) and Battle Of the Planets (75) amongst a bunch of other books for younger readers which must have had limited appeal to comic store patrons. 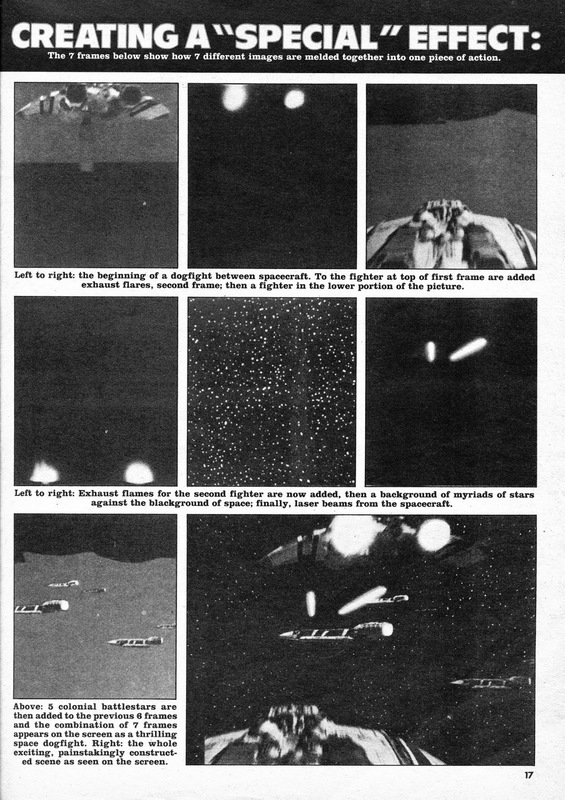 It's worth noting that these charts were compiled in a different way than similar charts you see today. The sample is based on a small number of comic book stores at a time when the bulk of sales were still via traditional (although declining) outlets. 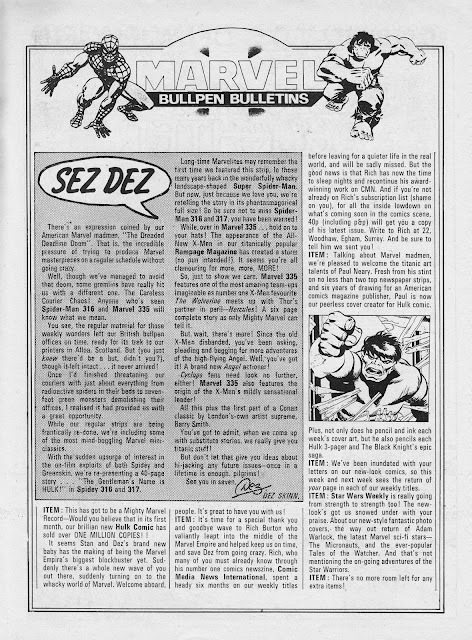 We were still a little way away from the first Direct Sales comic (Marvel's DAZZLER issue 1, 1981) and the wholesale shift in sales over the first part of the eighties. 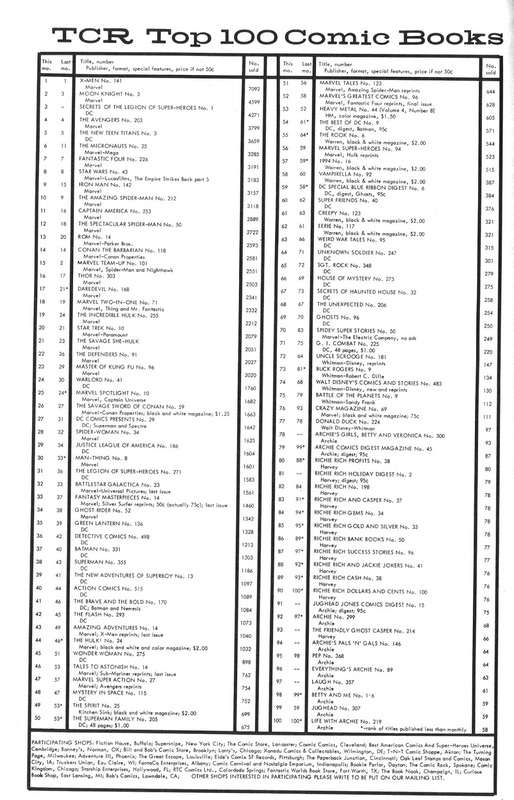 These charts were also based on actually sales rather than retailer pre-orders from their distributor. As such, they give a more honest picture of what was really selling as opposed to what retailers anticipated selling. 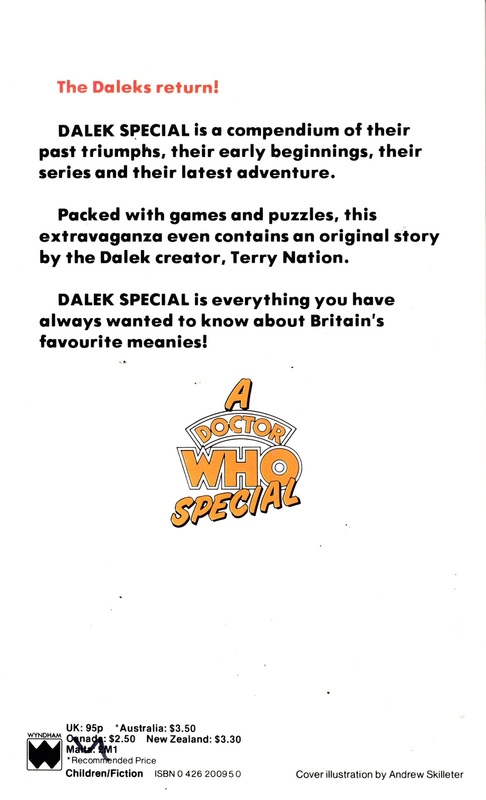 Terry Nation's DALEK SPECIAL, also by Terrence Dicks, was the even-more-exciteing companion to the K9 book I posted earlier in the week. It followed the same oversized paperback format and - once again - featured black & white illustrated (stills and art) interiors on good paper stock. 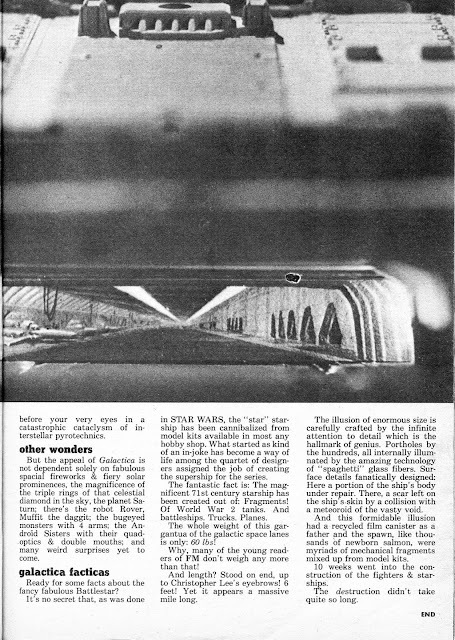 The star attraction were a short story by Terry nation which - I believe - had previously appeared in a newspaper or some such. 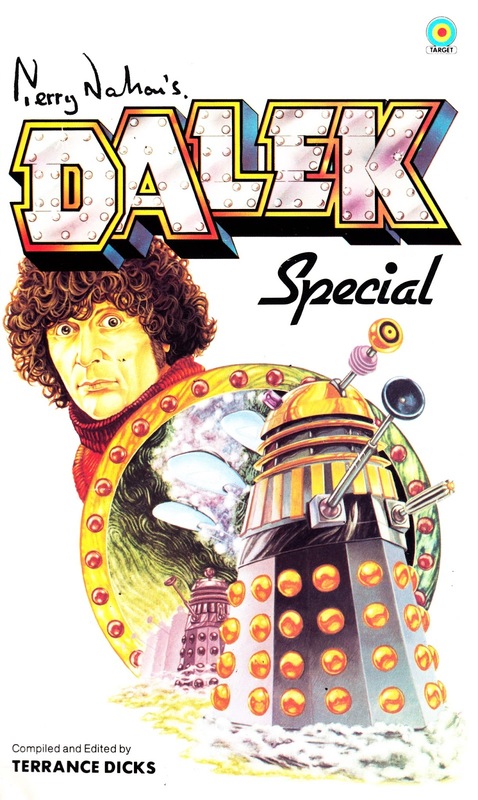 It's thirty-odd years since I last read it but I recall that his Doc-less tale of Daleks under London was pretty gripping at the time. 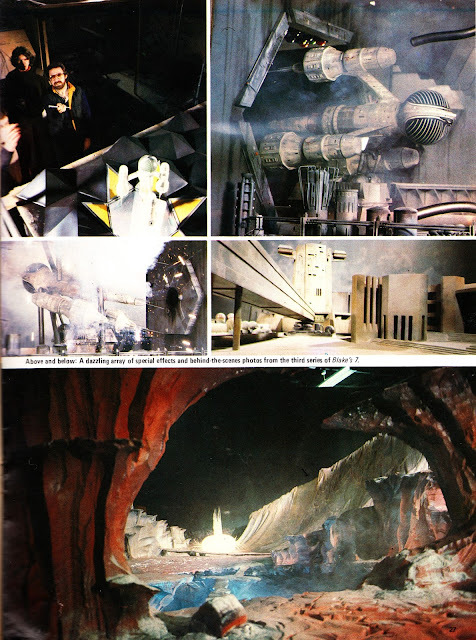 Another well-studied section was the innards-revealing Dalek cutaway (the K9 book had a similar feature) which finally revealed all the things the BBC SFX department couldn't. 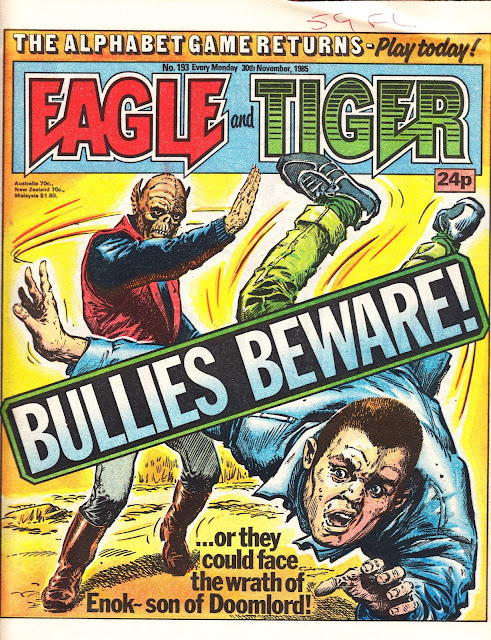 I recall a similar feature in the DOCTOR WHO AND THE DALEKS OMNIBUS, an oversized mid-seventies hardback from Marks and Spencer, but I don't think this was the same piece of art. Sir Terrence filled-out the rest of the book with a summary of the Daleks screen adventures to date (which seemed like ancient sacred texts to a young fan like me) and a background piece on Dalekmania. All simple stuff by today's standards but a real revelation at the time. These are a couple of MARVEL UK House Ads from 1984, the arse-end of their tenure as publisher of STARBURST MAGAZINE. These seem an exceptionally odd way to cross-promote a magazine covering a genre so rich in visual imagery and iconic characters. The second one especially looks like an elaborate office joke that's snuck out into the real world. It's more TIGHT FIT than INDIANA JONES. I have a feeling that Indy is a member of M-UK staff indulging in dressing-up games, although I have no idea who he is. Any thoughts? Here's a great full-page ROM piece, as published on the back cover of issue 169 of the US fanzine THE COMIC READER. 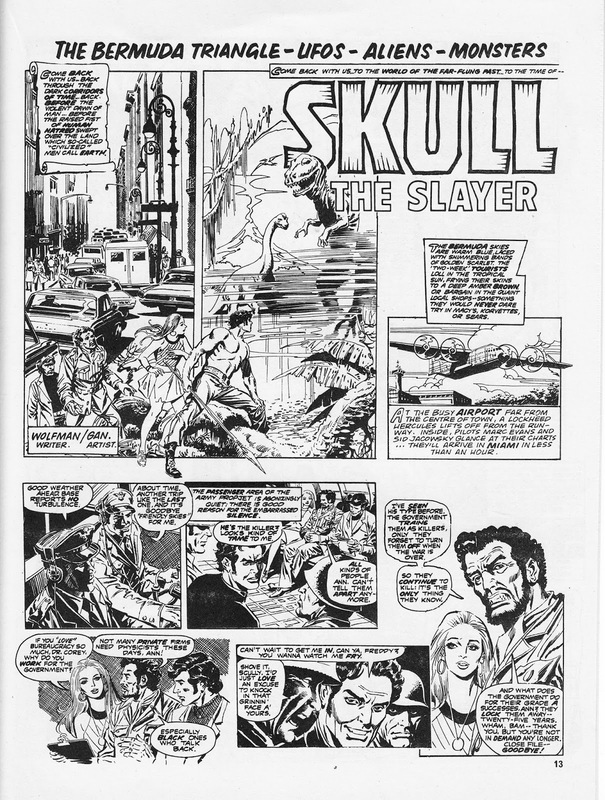 The piece is credited to John Romita Jr. and Marie Severin. In a sequel to yesterday's post from THE COMICS JOURNAL on Dez Skinn and his Marvel Revolution, here's how it reported Dez Skinn's departure from MARVEL UK in 1981. The full-page post was penned by Richard Burton, fanzine editor and Skinn's former righthand man at Jadwin House. 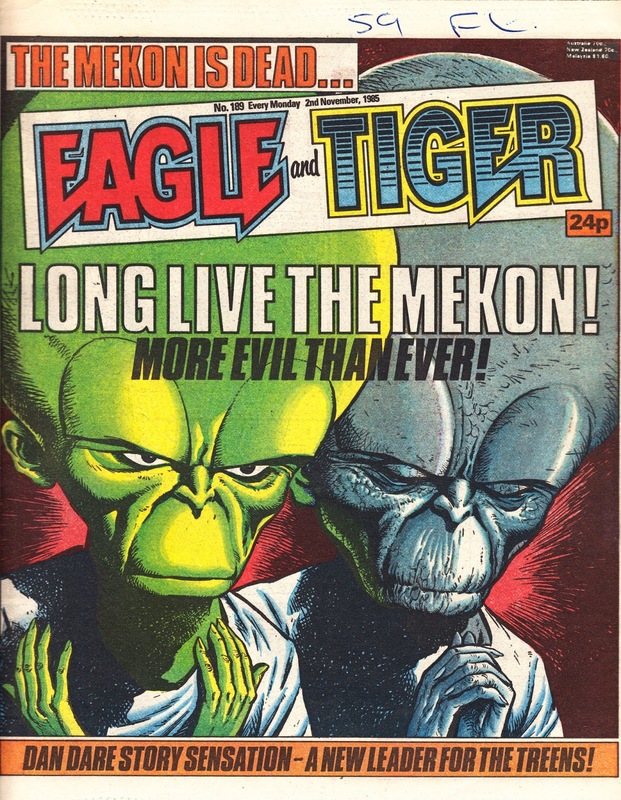 He later went on to be Tharg. As revealed in previous posts, I think it's safe to say that Dez departed under something of a cloud. Something that's not really reported in this piece. 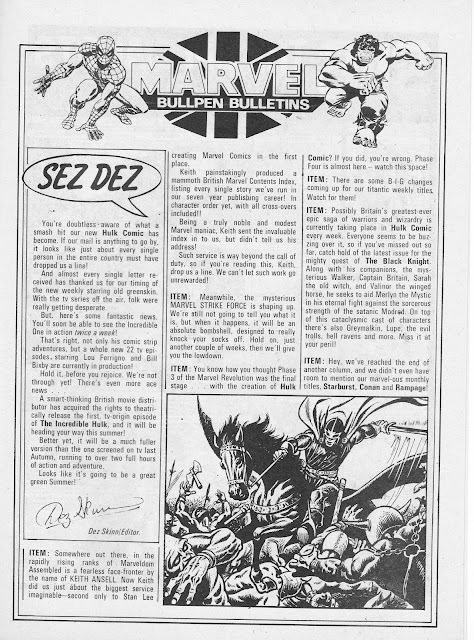 As an addendum to the MARVEL COMIC April '79 cover gallery (see my previous post), here are the full-page BULLPEN BULLETINS pages that appeared that month. 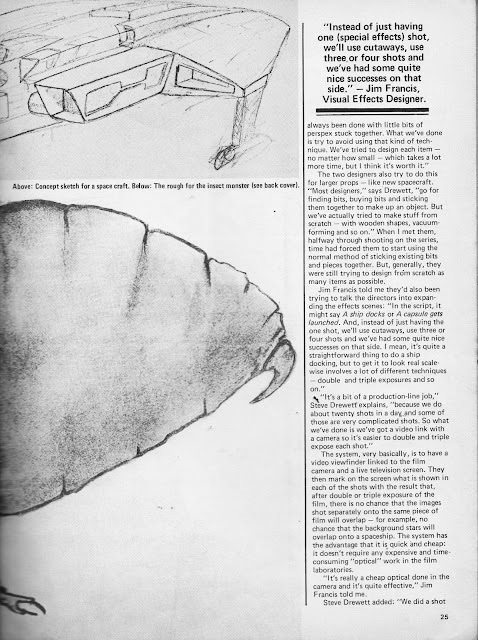 Note the new corporate logo which continued long past the end of the Skinn era and was still used on the company letterhead in 1989 (see here). The MARVEL STRIKE FORCE was an unrealised plan by Skinn to mobilise readers to (somehow) bolster Marvel's notoriously bad (shipping strikes not withstanding) distribution compared with its better-resourced rivals. Here's another run of eye catching covers from the short-lived MARVEL COMIC. The first April issue was the second of the "emergency" issues. 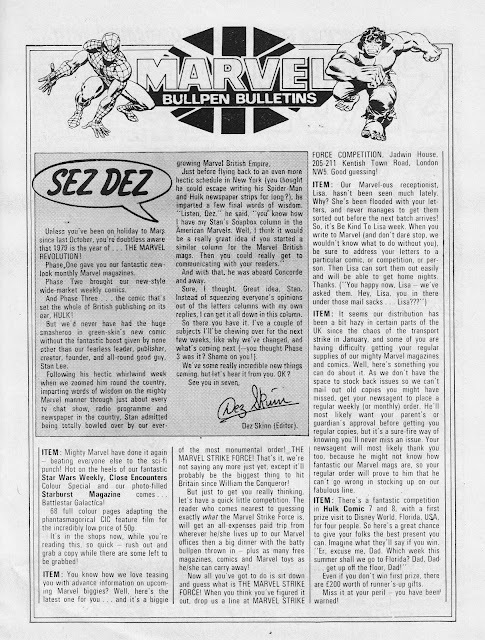 The London Bullpen would dispatch two issues at a time to their Irish printers so - in total - four editions (two SPIDER-MAN COMIC and two MARVEL COMIC) were lost by the courier. 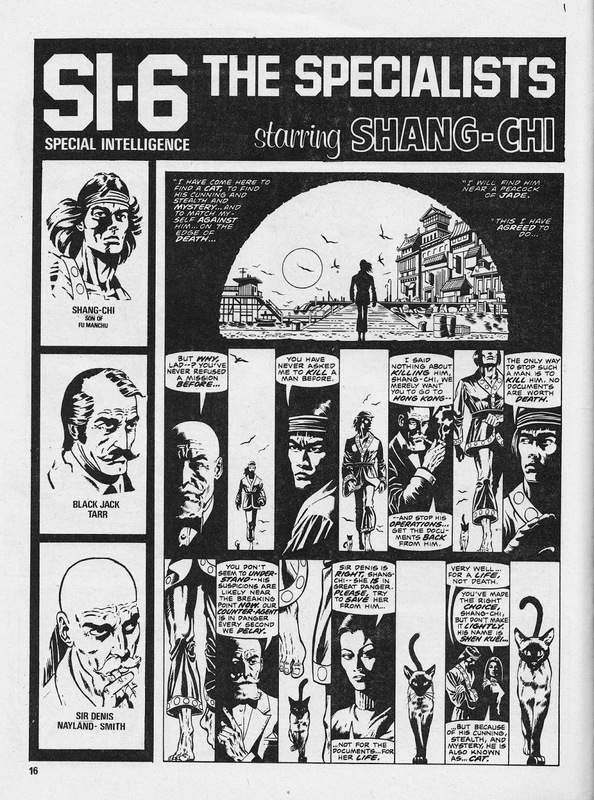 Rather than loose their slot on the presses, Skinn and co. cobbled together these issues from standby material (most of which hadn't been reworked to fit the SKINN I more-panels-per-page format). 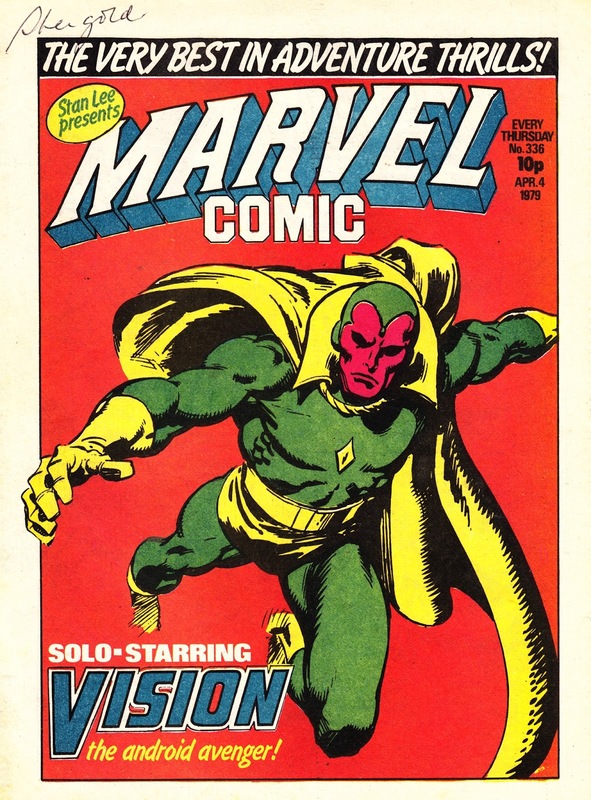 These ropey-looking issues (although the Vision cover is a corker) probably hammered more nails into MC just weeks after the prolonged distribution problems at the start of the year. Here's a legendary bit of tosh from the MARVEL UK vaults: the ubiquitous 1983 advertising campaign for - of all things - SLIPSTREAM LUBRICANT (no sniggering!) 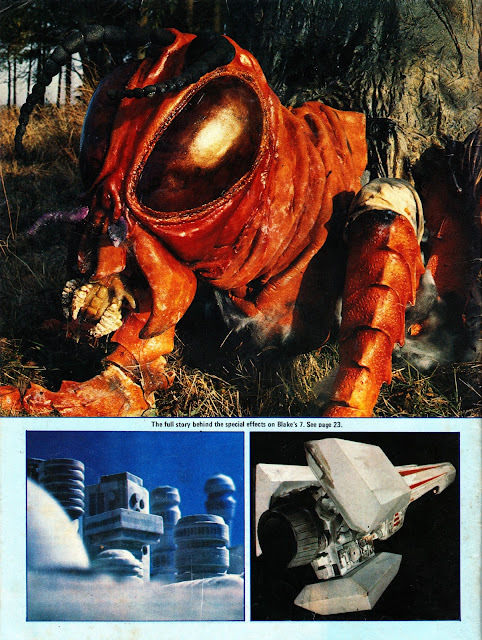 courtesy of The Synthetic Lubricant Co. Ltd. 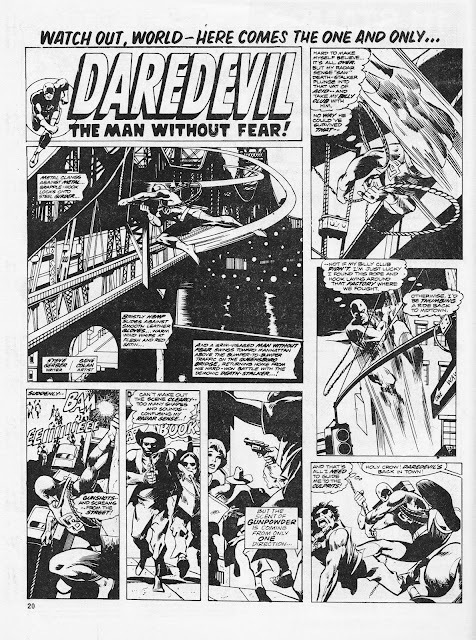 This full-page colour advert (and accompanying half-page mail-away offer) appeared across the Marvel UK line for what seemed like ages (it was probably only a month-or-so). 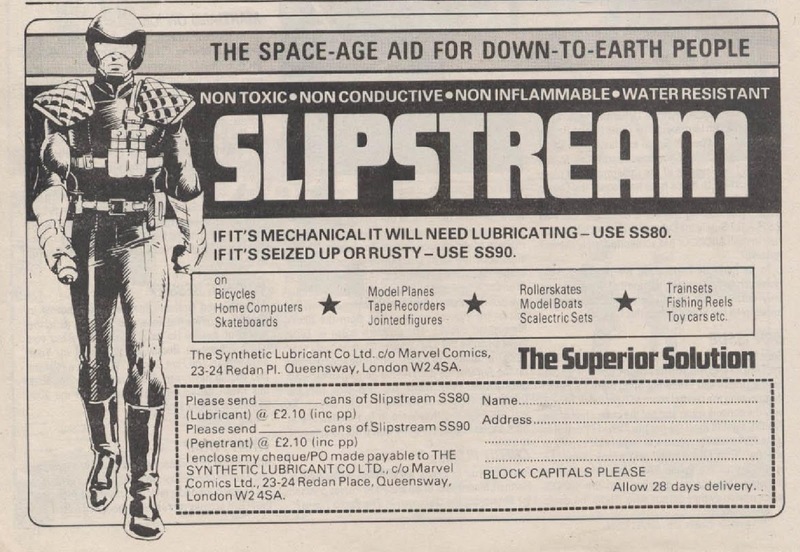 The uncredited (I feel like I should know the artist... but I don't) strip was a desperate attempt to make the most unsexy of products appeal to a young audience. You have to admire the end result, even if it IN NO WAY tempted me to buy the stuff. I'm not sure why you'd even bother to order it... surely if you need something lubing (behave) you just pop down to the local hardware store... not wait 28 days for a can to arrive via Royal Mail. 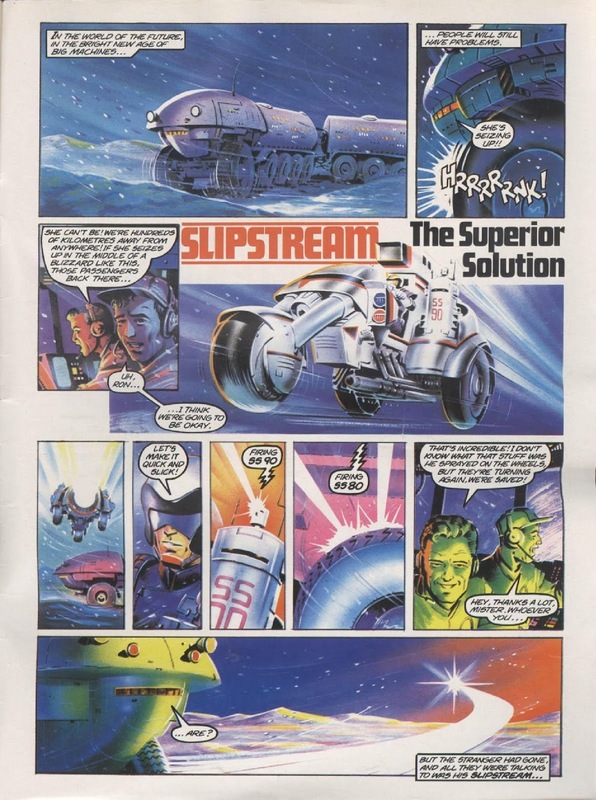 But - surely - it's time for the Slipstream man to be revived?!? My copy of Bob Baker's new autobiography, K9 STOLE MY TROUSERS, arrived from Amazon yesterday. I've only had time to give it the most cursory of glances (looks good!) 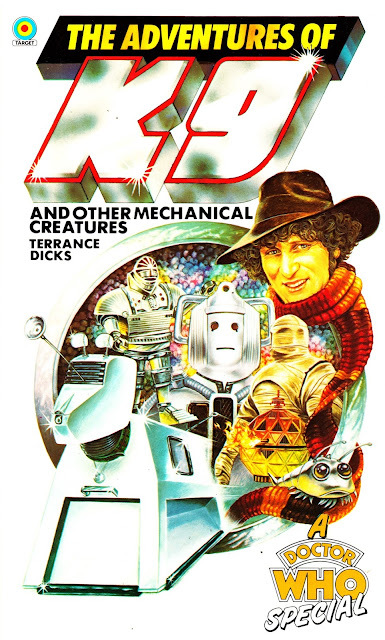 but it did remind me of this other essential K9 text, from 1979: THE ADVENTURES OF K9 AND OTHER MECHANICAL CREATURES by the ubiquitous Terrance Dicks. This was published - alongside a similar DALEK volume - by Target Books (of multiple paperbacks fame) and was one of the earliest DOCTOR WHO reference works. It's undemanding stuff but - for a seven-year-old fan - an absolute must-have. 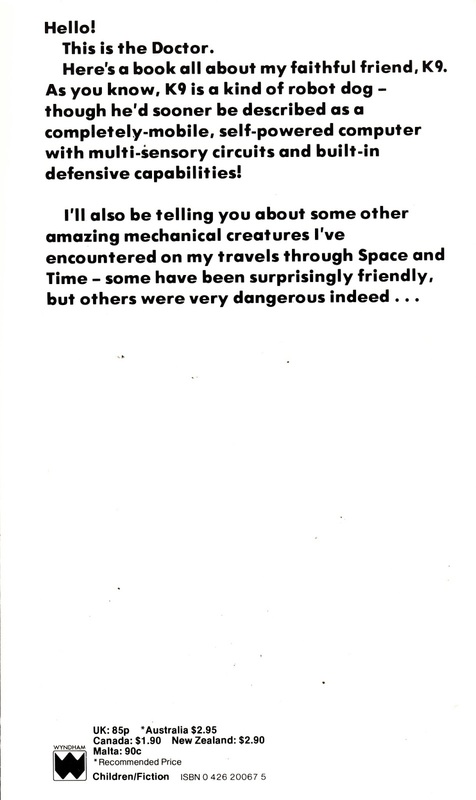 The mechanical mutt is - obviously - the main draw but clearly Dicks couldn't think of enough things to say so he expanded the brief to include various robots featured in the show to date. In the pre-home video era, and with no repeats of note on TV, these glimpses into the show's past were tantalising indeed. I wonder if today's young fans look at the various photo-heavy reference books of today and feel a similar surge of excitement about the show's hitherto undiscovered past? 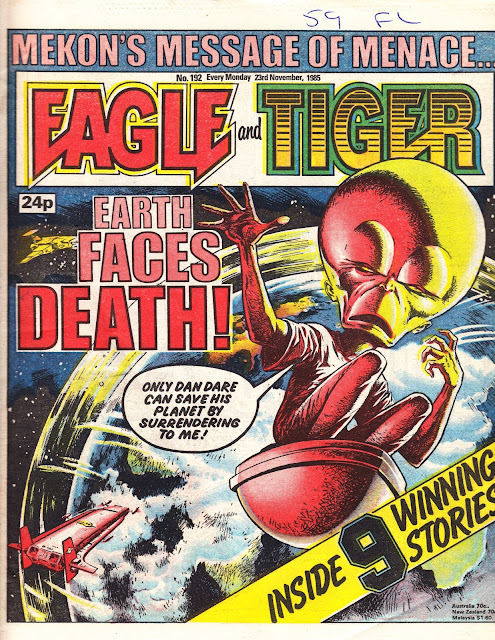 Priced at 85p, this wasn't cheap but I kept hassling my parents every time we went to WH Smith until they bowed to the inevitable. My original copy eventually fell apart and this is actually a recently acquired replacement. I'll post the DALEK book soon. 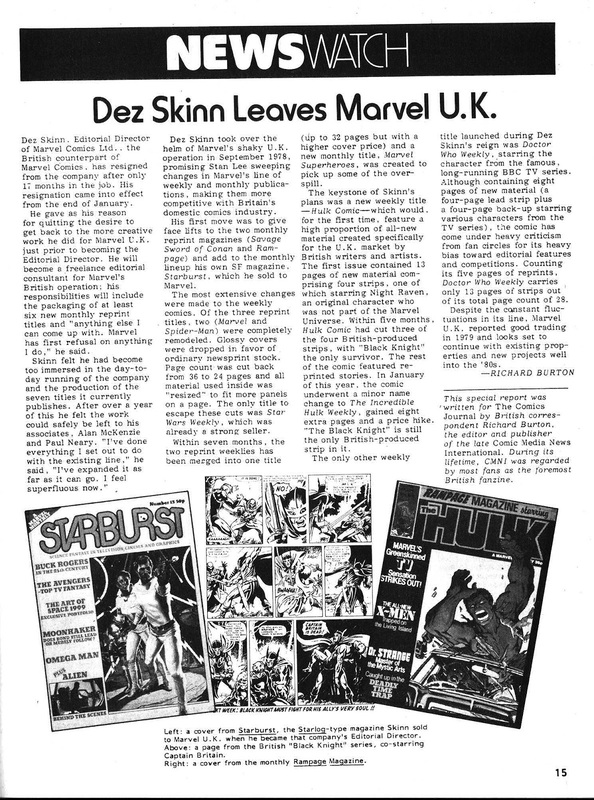 I've inadvertently given Dez Skinn's 'Marvel Revolution' a lot of coverage in STARLOGGED.... that's more accident than design and mostly because there was a lot of good ol' Marvel hype about it at the time. 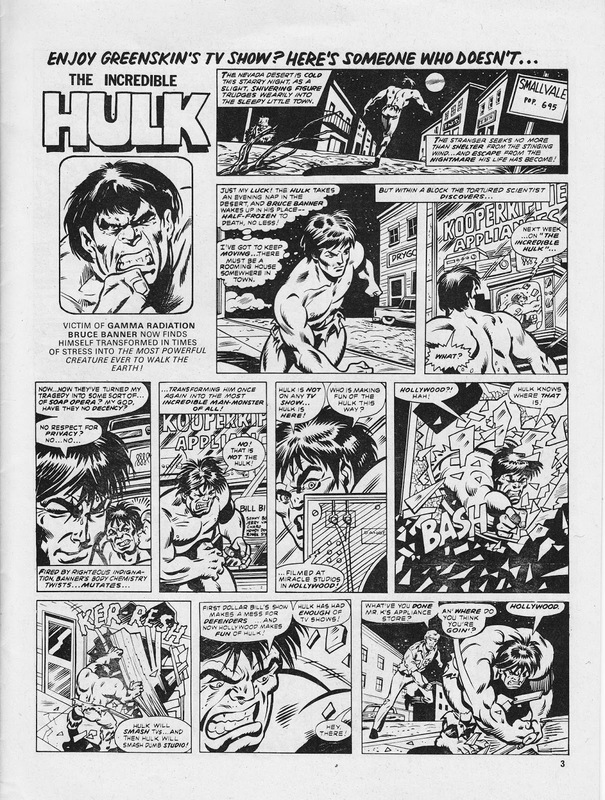 What I wasn't expecting to find was coverage of MARVEL UK in the seminal US fanzine THE COMICS JOURNAL. 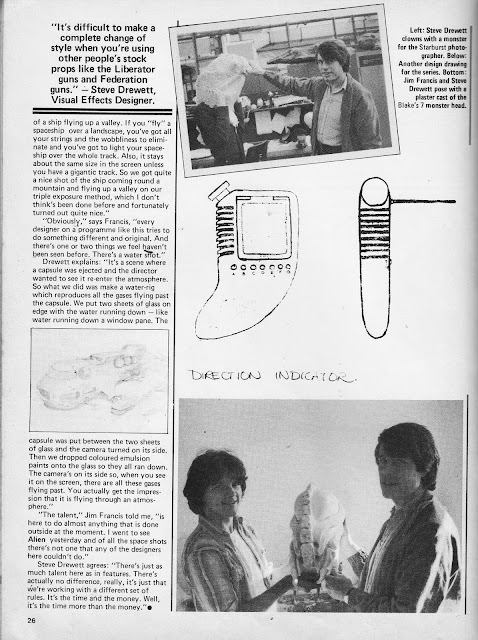 So, imagine my surprise when I found this full page article from issue 45 (cover-dated March 1979). This is a frankly awesome FAMOUS MONSTERS cover (146), from the summer of 1978, pitching (a ridiculously large) JAWS (1975) against (a diminutive) KING KONG (presumably the 1976 remake). 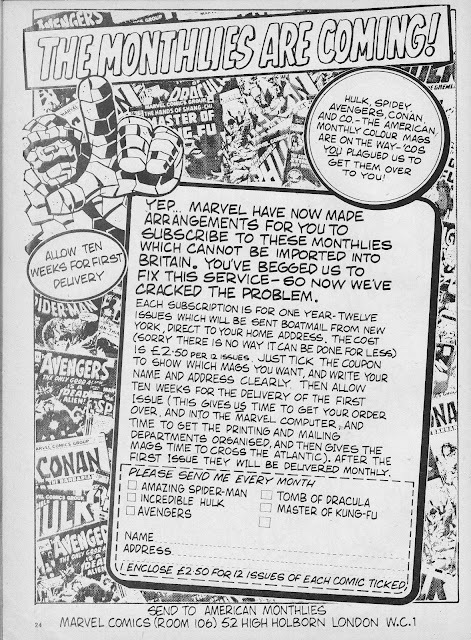 Here is an interesting one from July 1975: the opportunity to subscribe to selected hard-to-find US colour monthlies, direct from Marvel UK. 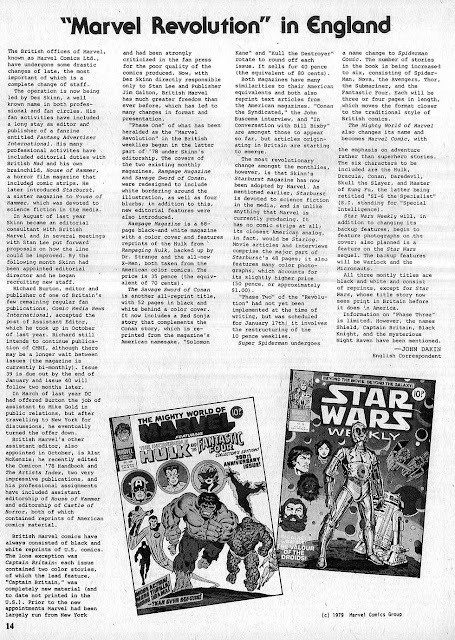 I assume the embargoed titles (AMAZING SPIDER-MAN, INCREDIBLE HULK, THE AVENGERS, TOMB OF DRACULA and MASTERS OF KUNG FU) were all made unavailable in the UK because they would eat into sales of the UK weeklies (even through most of the strips were still years behind the current US editions at this point) as well as - probably - avoiding any confusion amongst newsagents and distributors being presented with two comics with the same name. 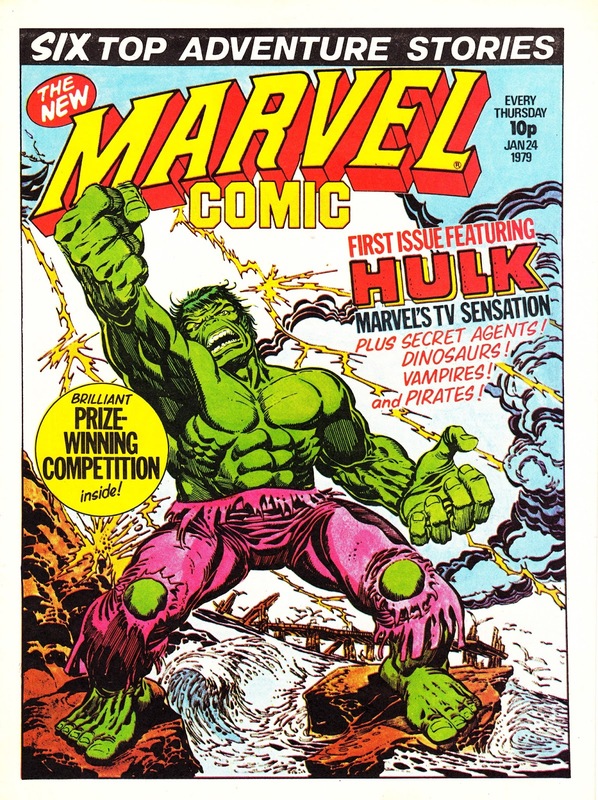 The Hulk was the main attraction in THE MIGHTY WORLD OF MARVEL whilst Masters of Kung Fu was obviously considered a highly bankable supporting feature in the British edition of THE AVENGERS. CONAN THE BARBARIAN is prominently featured in the advert's artwork and mentioned in the text top-left but isn't one of the available titles (it probably should have been the last option listed). This may be because someone boobed or - probably - plans changed at the last minute because the UK weekly was cancelled, after only 18 issues, just as this advert appeared. 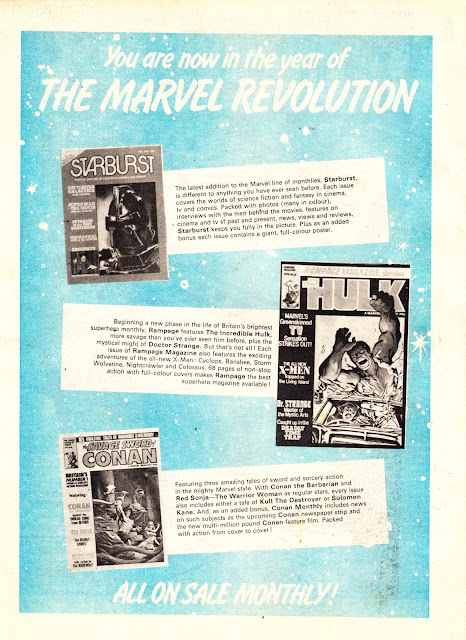 This is a 'Marvel Revolution' House Ad, extolling the virtues of the revitalised UK monthlies, from May 1979. Continuing my occasional series of behind-the-scenes articles on the special effects of TV shows that begin with the letter "B", here's a nice article, from the 20th issue of Marvel UK's STARBURST, covering the SFX of BLAKE'S SEVEN. It's a show with a (sometimes deserved) reputation for ropey visuals which - I think - makes this piece even more interesting as it shows these things weren't always just thrown together at the last moment. 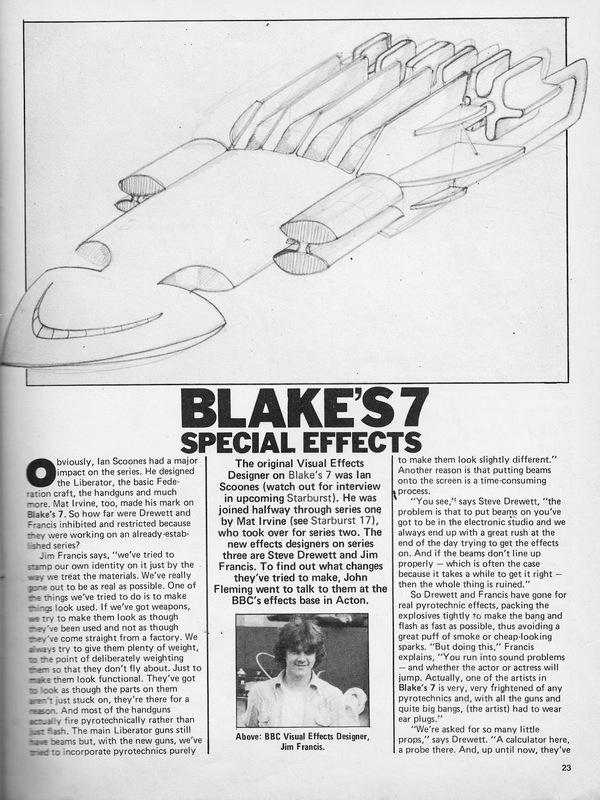 The BBC Visual Effects Unit is long-since defunct, the victim of changing technology and the multiple restructuring within the Beeb. Here's another BATTLESTAR GALACTICA article, concentrating on the show's special effects, from FAMOUS MONSTERS issue 151 (Cover-dated March 1979). 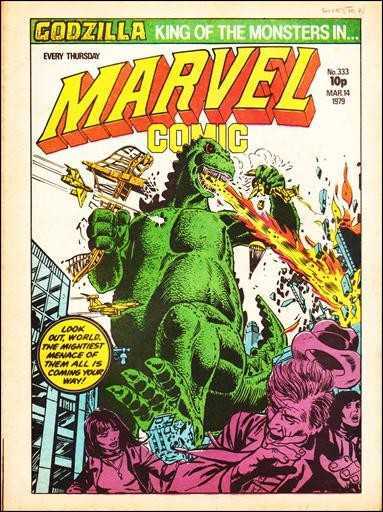 Was MARVEL COMIC doomed to failure from the beginning? It certainly got off to a very inauspicious start. 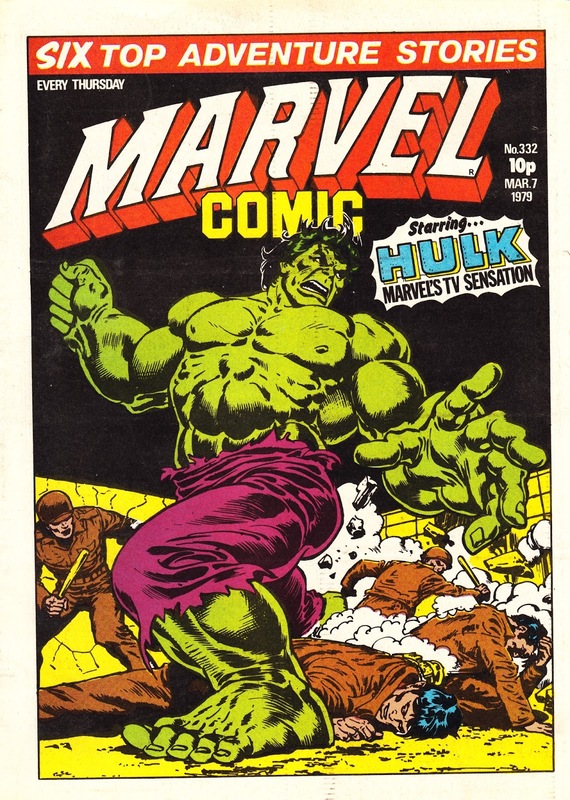 Dez Skinn's much-hyped Marvel Revolution unfortunately coincided with a national haulage strike which played havoc with the distribution of Marvel's titles. 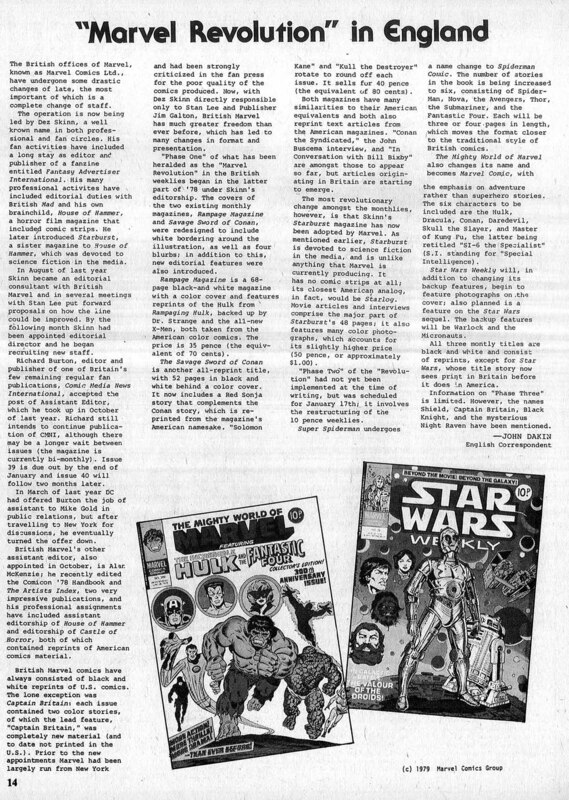 Some areas apparently started receiving copies of the new-look weeklies BEFORE the last copies of the pre-revolution editions. Other areas - inevitably - didn't see copies at all. 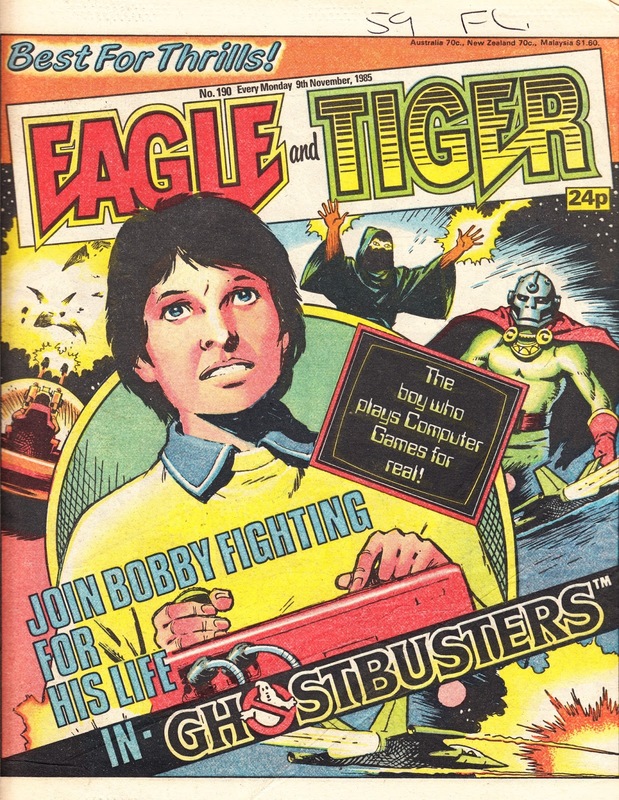 As a result, the second issue of MC arrived undated in newsagents to try and minimise confusion. 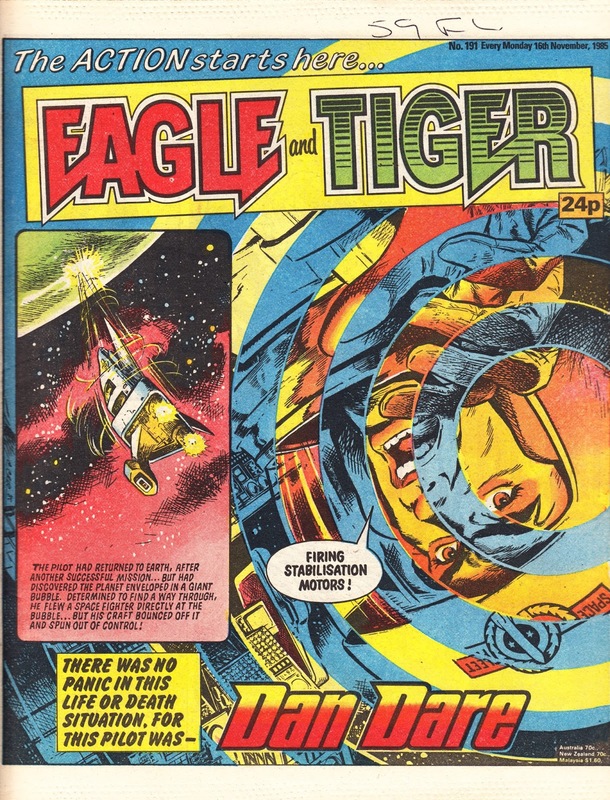 However, the lack of an on-cover issue number probably hindered, rather than helped, the situation. 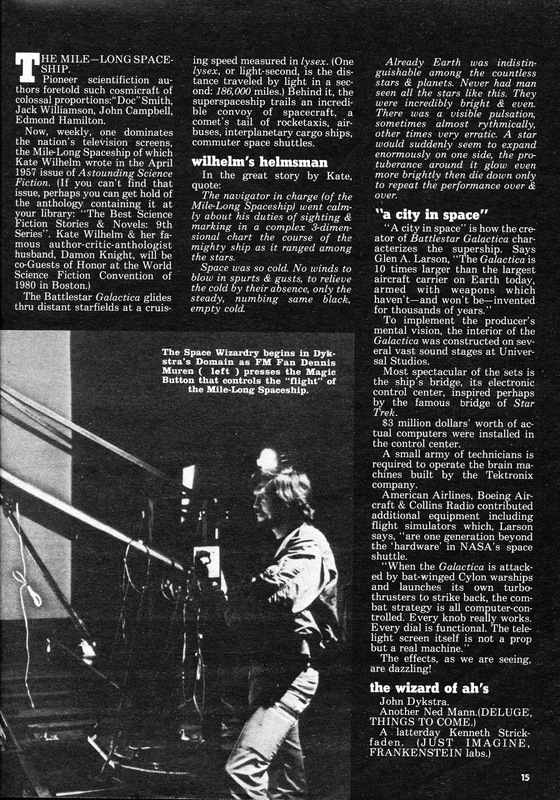 After only two issues, publication was suspended and only resumed in early March. 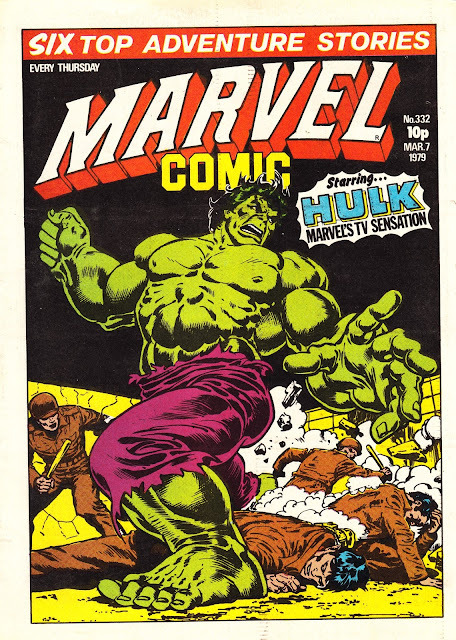 The Hulk only appeared in the first three issues of MC before transferring to his own weekly to capitalise on the success of the live-action TV show running on ITV. 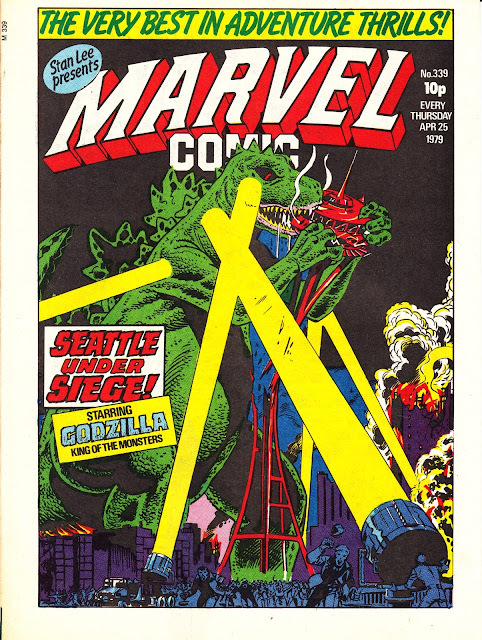 Skinn wisely replaced him with another bankable green goliath with a good media profile: reprints of the licensed US Godzilla strip. The end of the month saw another crisis hit when the courier company charged with rushing the completed issues to the printer managed to misplace the whole consignment. 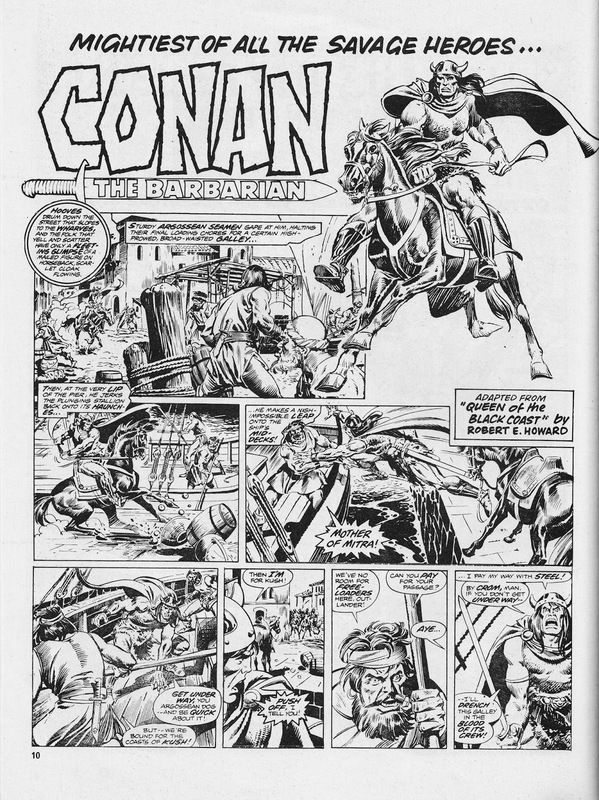 The London Bullpen despatched two issues at a time to the printer, resulting in the loss of four completed editions. 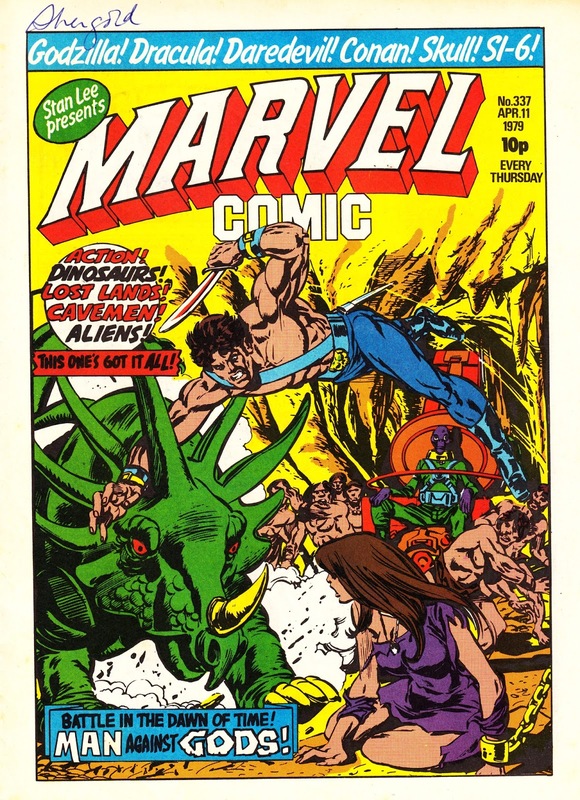 The lost issues were Marvel Comic 335 & 336 and SPIDER-MAN COMIC 316 & 317. 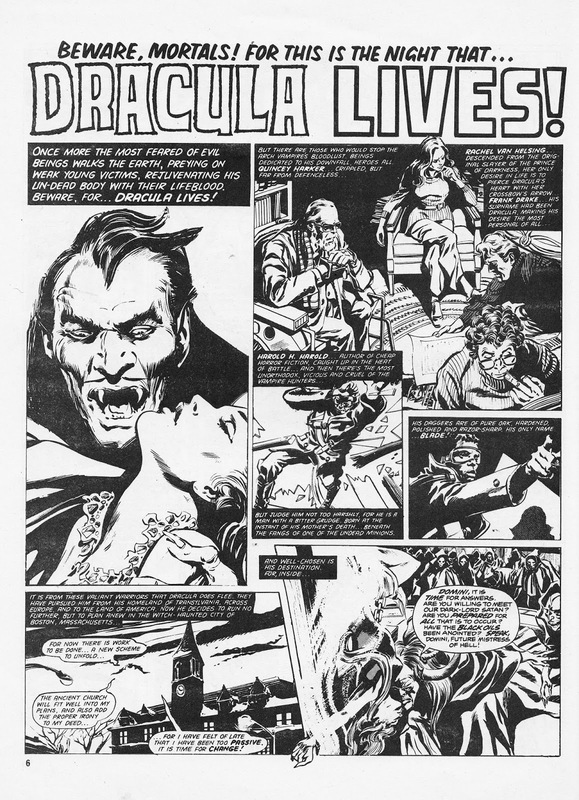 Unwilling to loose more sales so soon after the strike, Skinn hastily assembled 'emergency' issues using inventory strips that hadn't been re-edited to fit the new more-panels-per-page format. Dez did at least use the opportunity to run strips, like the X-Men, that cross-promoted the UK monthlies. Skinn's first new-format Bullpen Bulletins explained what was happening. New year. New comic. And the next stage of Dez Skinn's Marvel Revolution*. Despite the hype, readers of THE MIGHTY WORLD OF MARVEL must have been more than a little confused when, in mid January 1979, they found MWOM AWOL, replaced by a 'new' weekly: MARVEL COMIC. 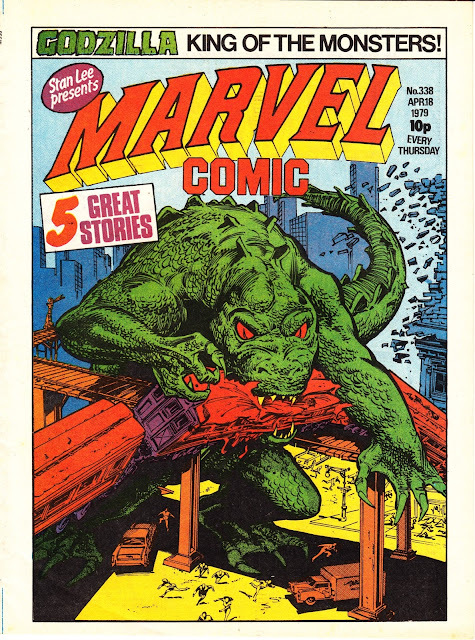 The venerable MWOM (Marvel's first British weekly, launched in 1972) had spent much of the seventies as a weather-worn dumping ground for Marvel's failed weeklies and sales were moribund. Stan's new man in London, Dez Skinn, decided radical surgery was the only thing to avoid cancellation. 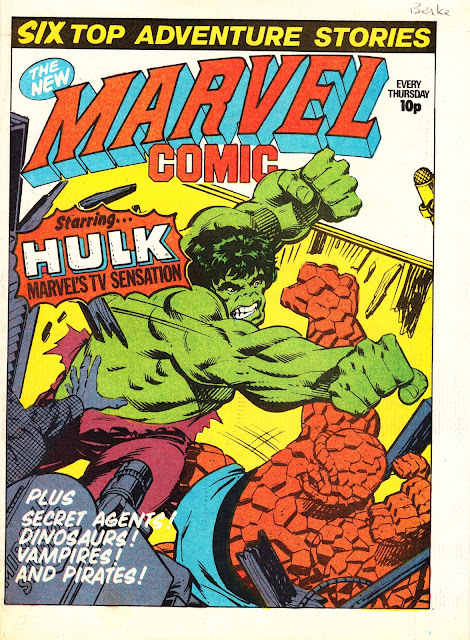 The new Marvel Comic was an adventure weekly with only a sprinkling of superhero strips. 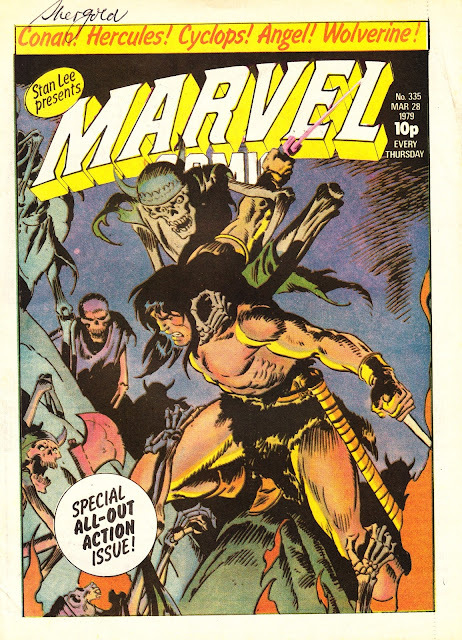 As you'll see below, a wider range of reprints included horror (from TOMB OF DRACULA), fantasy (SKULL THE SLAYER and the inevitable CONAN THE BARBARIAN) and martial arts adventure (MASTERS OF KUNG FU) alongside THE INCREDIBLE HULK and DAREDEVIL. 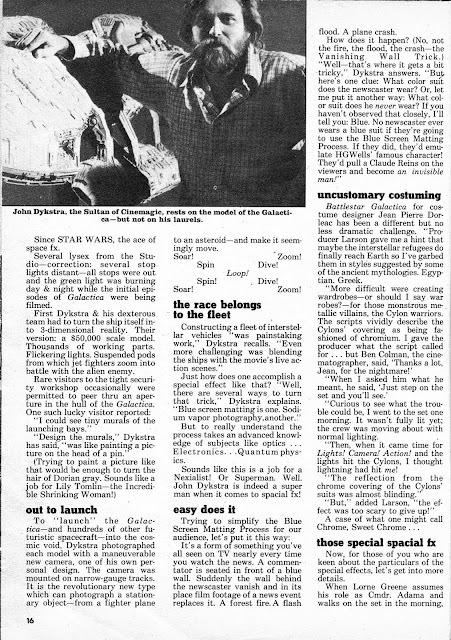 To cut costs, and make the UK line more closely resemble their homegrown rivals, Skinn also pruned the page count (down to a mere 24 pages) and jettisoned the glossy covers in favour of newsprint. To fit more material into less pages, and increase readers perception of value, Skinn took his scalpel to the original US pages and crammed more panels per page (he did the same to the similarly relaunched SPIDER-MAN COMIC but left STAR WARS WEEKLY well alone... partly because he was already struggling to find enough material to fill the existing format). 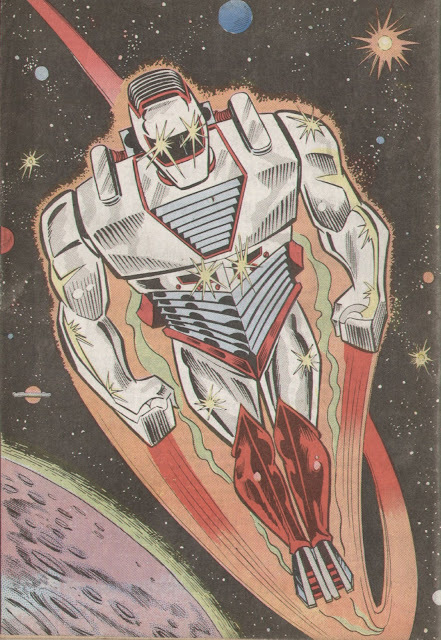 Splash pages, recaps and creator credits were also done away with. SI-6 THE SPECIALISTS was a shameless riff on LWT's popular post-watershed show THE PROFESSIONALS (the fictional CI-5) in an attempt to pass-off dated (but still excellent) MASTERS OF KUNG FU reprints. The Green Goliath, a mainstay of MWOM since the first issue, briefly survived the changes but only to allow time for Skinn to launch the third stage of his British revolution: the launch of HULK COMIC. I've posted the first pages of each of the strips below. I'm not familiar enough with the original material to be able to identify where the strips first appeared stateside. Can anyone help? 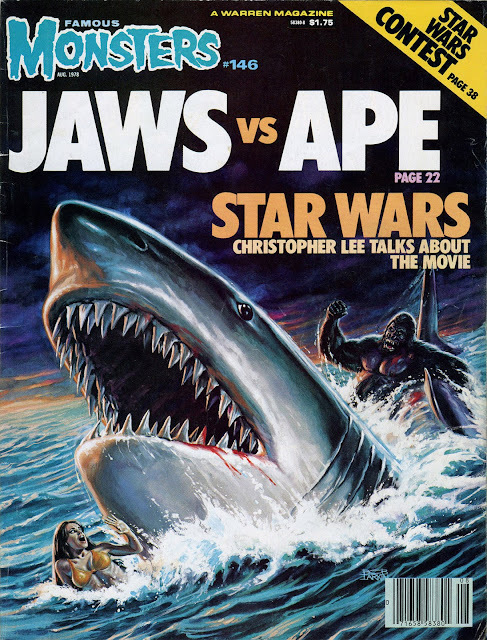 To emphasis the 'newness' of the MC, the issue number was dropped from the cover for the first few weeks. 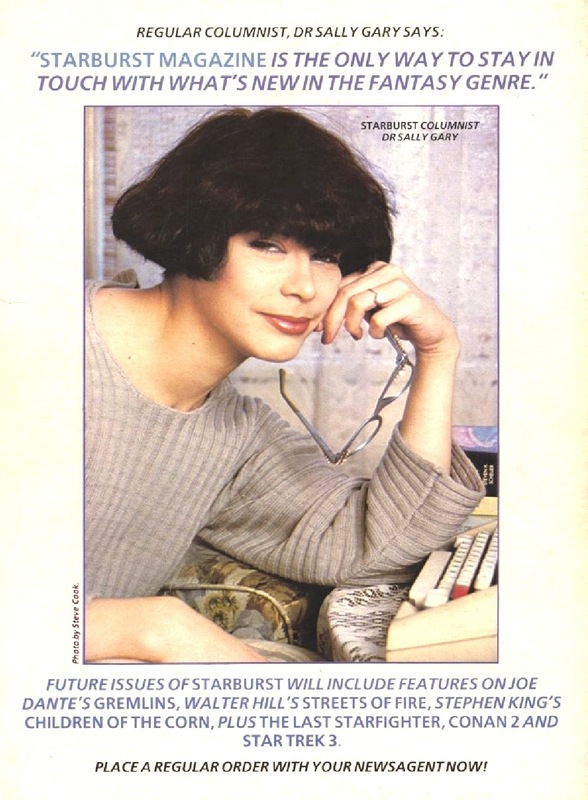 This would have been the 330th issue of MWOM. The Marvel Comic incarnation wasn't a sales bonanza and - by the summer - Skinn was forced to admit defeat and rolled it into SPIDER-MAN COMIC. At the same time, he announced plans for a new monthly - MARVEL SUPERHEROES - which would (subtly at first) retain the same numbering. Over several posts, I'll run a full cover gallery for MC as well as some other supplementary material. * Phase 1 was an overhaul of the monthlies. - Marvel House Ads promoting the new SPIDER-MAN COMIC and MARVEL COMIC (here). - The history of THE MIGHTY WORLD OF MARVEL can be found here. - The first issue of THE MIGHTY WORLD OF MARVEL, marking the launch of Marvel UK, can be found here. - A MARVEL SUPERHEROES: A MARVEL MONTHLY cover gallery begins here. 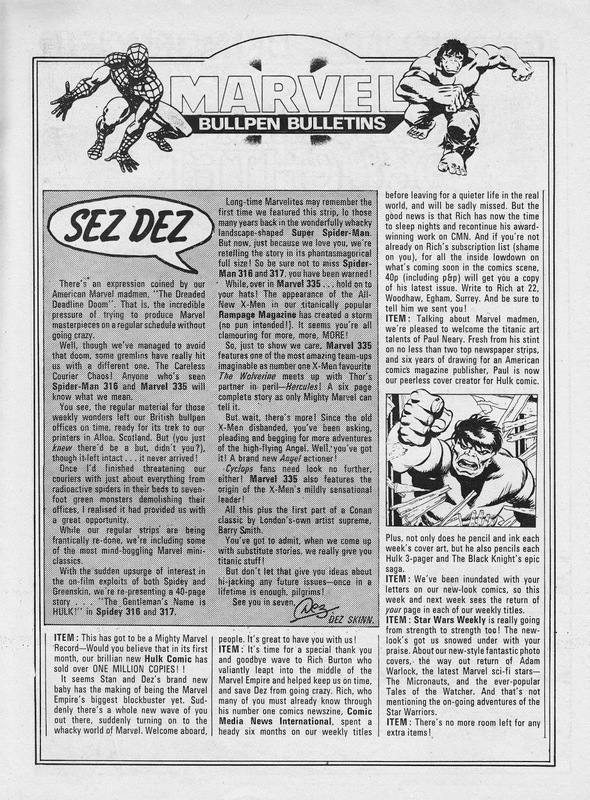 - Dez Skinn writes about the Marvel Revolution in Bullpen Bulletins here.